Dutch artist Theo Jansen made his name creating intricate and elegantly haunting 30-foot-long plastic creatures that walk on their own, powered by the wind. Now his contraptions are spawning home versions. Working with Gakken — a Japanese publisher with a science bent — Jansen is offering a Mini Strandbeest kit based on one of his full-scale designs. 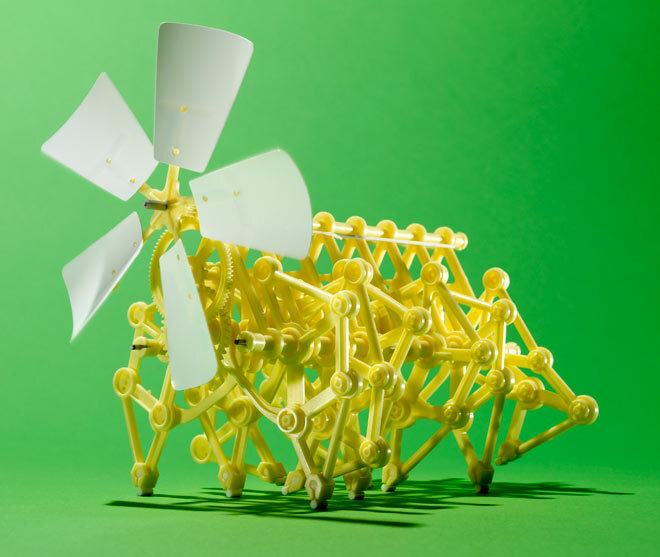 The 8-inch model is as complex as its forebear, with 120 parts that snap together to form 12 jointed legs, a spinelike crankshaft, and a wind turbine. Ours took about 90 minutes to assemble and walked across most flat surfaces, even packed beach sand and slight inclines. The ingenious movement is hypnotic, but unlike some of the full-size beasts, which use a system of pumps and soda bottles to store energy, the Mini stops when the wind does. WIRED Given the complexity, the instructions couldn’t be any clearer. One of the most satisfying models you’ll ever build; you kinda feel like you’ve created life. Oddly relaxing to watch. TIRED Needs a constant breeze. A bit fragile, and there aren’t any replacement parts available; break a piece and you have to glue it or buy a new kit.